Neither of us slept well last night and were up at 4.00am. I didn’t mention it to Jan but I was rather concerned about the turn into Selby Lock. In preparation, I’d read all I could on the internet about various approach techniques and had viewed the lock approach on Google Earth in an effort to estimate the width of the river. 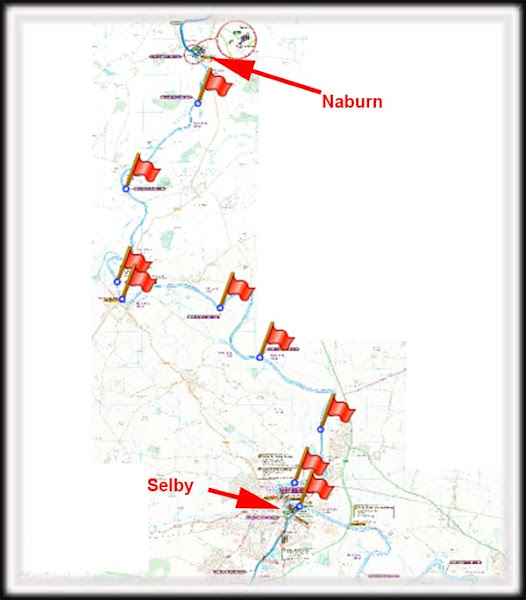 Paul Balmer (Waterway Routes) had sent me his gps trace and waypoint timing for the journey from Naburn to Selby locks. Using this information, in conjunction with his canal maps, enabled me to plan our own passage. As far as I was concerned the timing of our arrival at Selby Lock was critical. We would be arriving when the tide was still going out and I needed to be ahead of all the debris that would be coming back downstream with the tide. Paul’s canal maps have proven to be invaluable. Using the map and information from both gps traces I calculated the time we should reach each waypoint. This information was written in a notebook and Jan became the designated timekeeper. I would call out when we passed each waypoint and she would check the time. The Naburn lock keeper was on site before 8.00am and informed me there would only be two boats going down. I pointed to the small Sea Otter narrowboat which had also arrived that morning. The lock keeper simply replied “He’s not booked!”. At 8.30 the other boat and Waiouru were in the lock. I asked the other steerer if he had done the trip before. He confirmed he had and so I suggested he go first. This would mean he would be the first to enter Selby Lock which would enable me to watch his technique. However it also meant he would be turning first. I’d therefore probably have to continue past him before making our own turn. 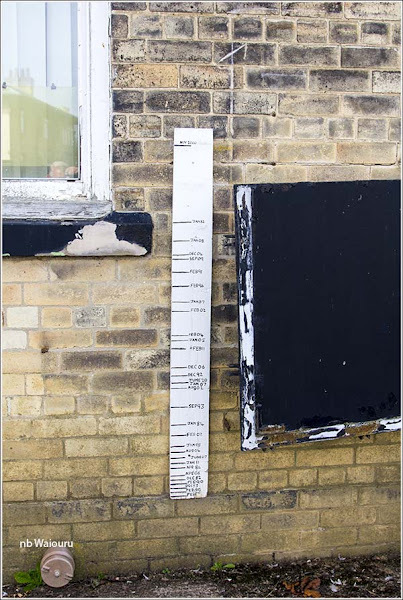 Then I noticed the unofficial flood level record board on the CRT building. This building is adjacent to the lock. 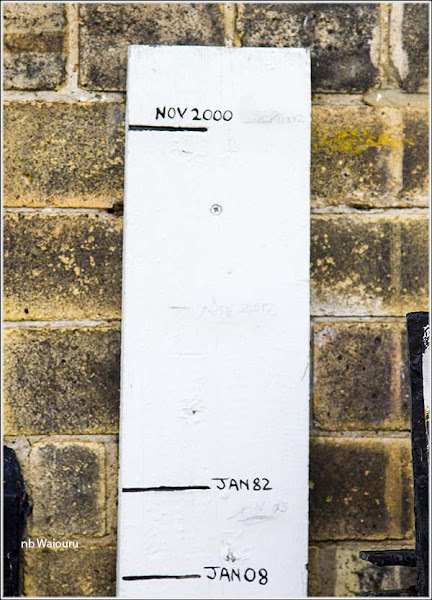 The top of the lock is considerably higher than the weir. That top mark is above the windowsill. OMG. That’s a huge volume of water going over the weir and the top of the lock. At 8.40 the lock keeper opened the gates and waved us out. The lead boat pushed into the oncoming tide. It wasn’t that powerful because it was being held back by the weir. However after a kilometre both boats found the going much slower as we pushed against the increasing speed of the incoming tide. About 30 minutes after leaving the lock we encountered three boats coming up with the tide. They would have left Selby Lock about 2 hours 15 minutes earlier than our own departure. Shortly thereafter we hit the floating debris coming up with the tide. Much of it looked very familiar from our own cruise up from Selby a week earlier. Even buttercup the cow floated past. We just attempted to follow the path of the lead boat hoping he would spot all the large obstacles. The plan of Jan checking the waypoint times worked well and we seemed to be maintaining the planned times. As we reached the tail end of the debris the tide turned and our speed dramatically increased. About halfway down we went under Cawood Swing Bridge. This was halfway in physical distance rather than time. As we reached the last kilometre I started to ease off the throttle allowing the boat ahead to gain some distance on us. My plan was to round the last bend in time to observe him winding (turn 180°) in the river and then approach the lock against the tide. He actually did what I intended to do and commenced his turn in the wide section of river before the lock entrance. After completing his turn he eased his bow into the slack water immediately in front of the lock and then completed a 90° turn into the lock. Unfortunately I couldn’t turn prior to the lock because he was in the way. Consequentially I went past the lock entrance before commencing the turn. First I manoeuvred Waiouru as close to the port (far) bank as I dared to give me maximum width for the turn. Then I reduced the engine revs to save the power for the actual turn. The current was still pushing us quite swiftly downstream. Jan was sitting on the starboard side of Waiouru which would be the upstream side when I undertook the turn. I had realized when we were broadside to the current Waiouru would list (tip over) towards the downstream side. Having both of us on the upstream side would add another 250kg to the weight on the upstream side(yes… we’re a couple of fatties). I threw the tiller arm across and applied power. Waiouru turned across the flow but we seemed to just be moving sideways and; more alarmingly; heading towards the opposite bank rather than getting the bow fully around. I applied even more engine power (probably 2000rpm) and out of the corner of my eye I could see blue smoke from the exhaust. The bow slowly came around and pointed upstream against the tide. By now we were close to the near bank. I then quickly reduced power back to our usual maximum of 1500rpm. We slowly made headway against the current and I manoeuvred Waiouru so that she was parallel to the home bank and about 7 metres from it. As the bow passed the entrance to the lock I turned the tiller slightly to the right allowing the current to catch the bow and push it to the left. Using more power I maintained the boat outside the entrance to the lock and when the bow started to almost point into the lock I turned the tiller harder to the right and applied more power. As soon as Waiouru hit the slack water in the entrance to the lock I reduced the power and we gently glided into the lock without hitting anything. What a relief! Typically there were no gongoozlers to applaud! No doubt I’d have completely muffed it if they had been present. I managed to avoid grinning and instead maintained a nonchalant appearance as if I did this type of manoeuvre regularly. There are no photos of this remarkable event because for the entire time the other person on the boat had her face in her hands and her head between her knees. 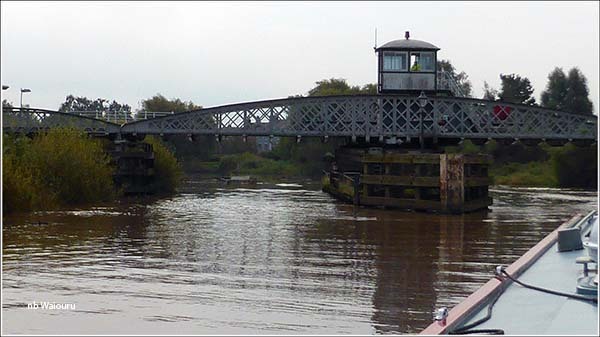 As we exited Selby Lock who did we see moored….. nb Lakeland! Our river cruise companions were mooring at Selby whilst we pressed on down the Selby Canal towards the River Aire. On the outskirts of Selby CRT were spot dredging. The dredgings were being put through a large separator which looked similar to a crushing plant. I assume this process is to remove any non biodegradable material from the dredging's (eg, shopping trolleys, tyres, etc). Haddesley Lock was empty and as the river was at the same level as the canal, transit through the lock was relatively quick. 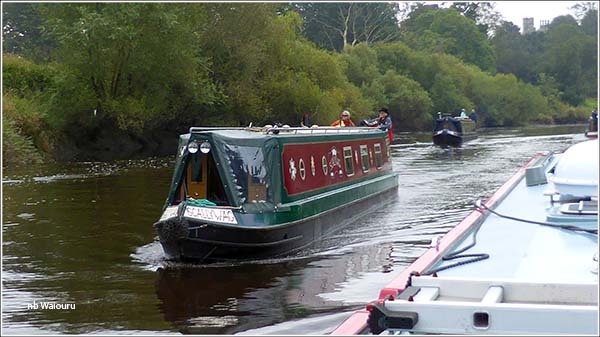 We then cruised back up the very boring River Aire to Beal Lock where we passed a boat going in the opposite direction. At Bank Dole Lock we met yet another boat about to go down onto the Aire. The boater kindly helped Jan work Waiouru up and then asked if the moorings a Beal Lock were vacant (they were). 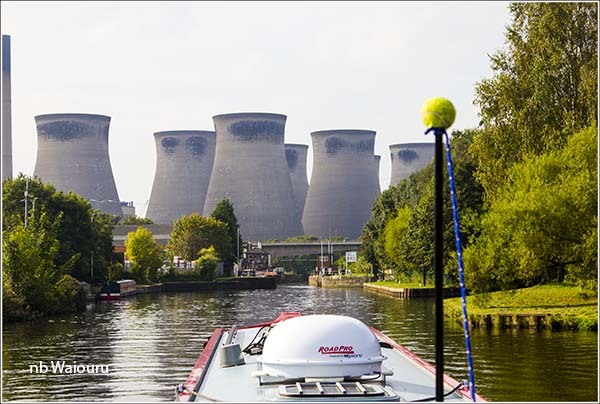 Passing through Knottingley and our former weekend mooring, we headed up to Castleford arriving at 5:30pm. It was a long day! However tomorrow will see us onto new waters. Just as I was erecting the pram cover a narrowboat slowly passed. The lady in the bow called out “Hello Tom”. Then I realized it was nb Firefly NZ. Later in the evening I walked over to Firefly NZ and introduced myself to fellow kiwis Ray & Leonie. They had arrived in Castleford after completing the Leeds and Liverpool Canal. Like us, they intend to now cross back over the Pennines via the Rochdale Canal. There might be an opportunity to share some locks! Good work on the lock, its sounds like an epic day. Ha Tom, I had a different instruction from the lockie at Selby when coming down the Ouse..
"Turn round at the railway bridge and drift down to the lock backwards"
I did and it worked a treat.. Here is that trip I did in 2004that you did..
Well done you.. It is a difficult one that. Everything else now will seem easy! I had intended to turn around and go backwards after the bridge but the boat ahead was part way through their turn and had yet to enter the lock. I didn't want to have a collision during our turn and so went past him, which is what the Naburn lock keeper told me to do.